Looking for Oticon hearing aids? Think of Tustin Hearing Center! Our Audiology practice has been serving patients in Orange County for over 30 years. Founded by Audiologist Dr. Janell Reid in 1989, we have since helped thousands of people hear better with Oticon and other hearing aid manufacturers. Our Audiologists only work with the top hearing aid manufacturers and most advanced and effective hearing aids out there! These top manufacturers include Oticon! Oticon products are known for their great sound quality and extremely fast processing chip. Their ability to enhance speech over background noise and give patients a spatial awareness of all the sounds around them makes Oticon a common solution used by our Audiologists. Outstanding sound quality is just one reason to choose Oticon hearing instruments. With a variety of makes and models to choose from, Oticon has solutions to help you with performance, tinnitus, and pediatrics – with accessories to make your listening experiences that much easier! We are excited to say that Oticon has announced its newest product – Oticon Opn. This new product combines breakthrough technologies proven to enable people with hearing loss to experience less listening effort and enjoy better speech in understanding. This product combines breakthrough technologies proven to enable people with hearing loss to experience less listening effort and enjoy better speech understanding. Its processor chip is 50 times faster than anything Oticon has ever built which is a giant leap in hearing device technology. Opn separates speech from noise and lets you focus on what’s important. And because Opn works in harmony with your brain to process sounds exceptionally fast, you get better speech understanding, less listening fatigue, and you’ll remember more of your conversations. Oticon Opn is engineered to better support how the brain processes sound, and allows the brain to follow and process multiple sound sources in noisy environments. As a result, listeners can confidently engage with the world around them. Previous hearing aids were designed to focus on the main sound in front and suppress background sound. Oticon Opn opens up your hearing to a full 360 degrees so you can now focus on a conversation while staying attentive to people and things around you, and switch focus quickly and easily. Opn adjusts and balances all the sounds around you, not just the ones directly in front of you. In addition, with Oticon Opn, you will notice a decrease in listening effort and an increase in remembering more of what people said to you. Oticon’s BrainHearing technology reduces cognitive stress and frees up the brain to perform other critical tasks. Through rapid signal processing, Oticon Opn fuels the brain in complex listening environments, so listeners experience less mental fatigue, more energy, sharper focus, better speech recall and, most importantly, less social isolation. As the world’s first internet-connected hearing device, Oticon Opn offers a full array of wireless possibilities by connecting directly to your iPhone. A TV Adapter turns your hearing aids into wireless headphones. 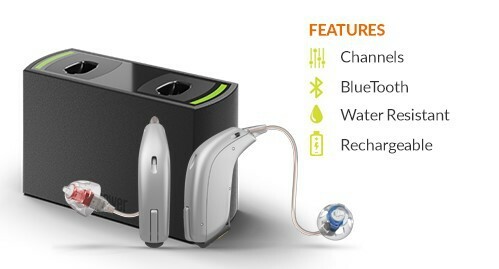 The Oticon ON App turns your iPhone into a remote control to allow additional control over your hearing aids. More convenient – There’s no need to replace batteries every few days. You don’t even have to open the battery door. What do you want to do? Watch TV, listen to music, use tablet or computer, and make and take phone calls. With ConnectLine and Streamer Pro you can connect your hearing aids to different audio devices and use them at a volume that suits you. You can also control them via your iPhone or Android phone. With Oticon’s ConnectLine family of media accessories, their advanced wireless technology provides even more ways to connect. ConnectLine makes it easy and convenient to use Oticon hearing instruments as a personal wireless headset, enabling better connections with people, information and entertainment. Find out if Oticon is right for you! If you are interested in knowing more about Oticon Hearing Aids, call Tustin Hearing Center for your personalized appointment. We work closely with you to have a clear understanding and explanation of your personal hearing situation so we can provide hearing aid recommendations to meet your individual needs, with the complete follow up care that you deserve!